Take a look at my half-face shot! That is how natural my brows look and it is possible with Pixi Natural Brow Duo in Natural Brown! The search for #KilayIsLife products continuous, I get nonstop queries about the best Eyebrow Products and I always say: "There's no such thing as BEST eyebrow product but there's always ONE that matches our lifestyle, our face and our requirements!" If you are the type who dislikes the "drawn brows" look. This is the product you may want to look into! This duo helps to provide polished brows, essential to framing the face and completing a beautiful, head-turning look. One end houses a waterproof brow pencil with an angled tip for precise application. The other end contains a tinted soft-hold gel for keeping unruly brows fixed. It comes with retractable pencil on one side and a gel brush on the other. 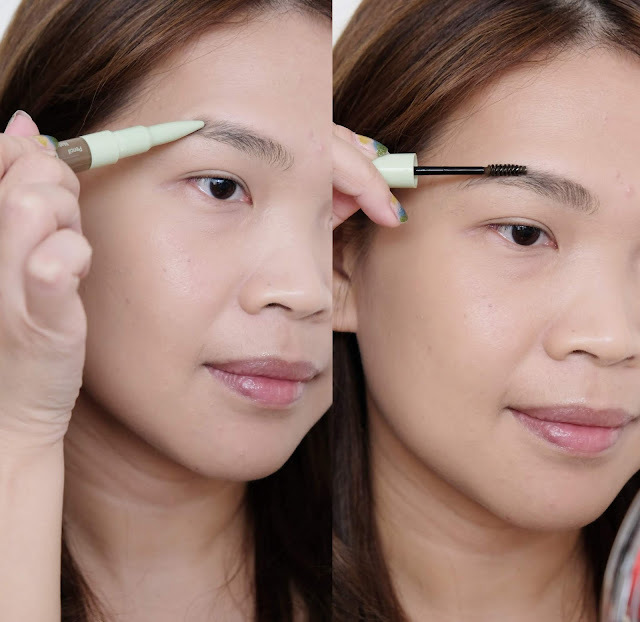 I always like to start by filling y brows using the pencil side of the Pixi Natural Brow Duo. The shade is just right and the texture of the pencil isn't too hard or soft. You won't get wrong whether you're a newbie or a professional makeup artist. Since I have long brows, the gel is the best product to use to tame them and it has a tint so it evens out the shade making the effect look very natural. Can you see how my after brows are filled in the most natural way? The Pixi Natural Brow Duo is very easy-to-use. Can be brought anywhere for instant gorgeous brows and re-application. If you are the type who prefers super defined brows, this may not make it to the cut Best to purchase a different shade, go for darker. How do you find my Natural-Looking brows using Pixi Natural Brow Duo? Gimme brow fiber gel in 3 is my brow color match wise. I apply it on the tail part of my brow for the #polboandliptint look.